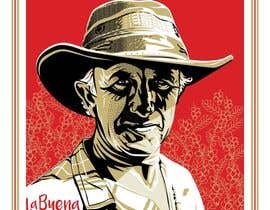 I need the illustration of the photograph attached (the farmer with the hat) to be used as a brand icon on coffee mugs, paper cups, paper bags and in-store front as a store signage and in the store as a mural for a coffee house. The visual should represent the coffee farmer's, honest and hopeful, sad but contented impression. We need to see his apple of the eye, should gaze upon the viewer and even pass beyond. The brand is about people, human rights, and equality. 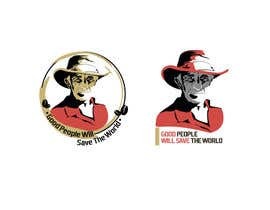 Motto: "Good People Will Save The World" is the brand motto and can be added onto the image. Main colors; black, red (Pantone 2035c), Pantone Gold, white. Border; can be used without a border on in the circle. Background; It can be without a background or there may be a coffee plantation and mountains represent the Colombian high hills coffee plantations. PLEASE NOTE: You will also see unqualified samples within the files, please do not submit if you exceed those not accepted previously. I really wanted to participate but unfortunately no time... i don't want to insult anyone, but common, be realistic and fair. From my point of view, everybody ( except maybe caloylvr) try to get quick win with vectorized, traced photos, templates and recycled work, max 1-2 days of work. I wouldn't award $500 to anyone here if it's my contest. $120 maybe.. But again if there's nothing I like, why throwing away the money. And one more time, no intention to insult anyone. Just being realistic. You're aware that I didn't mentioned you personally? I just wrote my opinion as a reaction to the last post by contest holder. Anyway, not interested in you proving anything to me.. so, chill out parceiro. Same here, I don't care if you didn't mentioned me. it's just my opinion about your reaction. Dear participants, I have to admit that I am not satisfied with the works submitted. 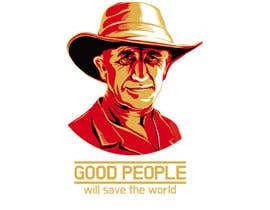 It is a simple brief illustrate the given picture (farmer) in the exact style of Shepard Fairey's. (Example - Shepard Fairey 1.jpg) I had also attached the previously rejected works. The outcome was a couple of poster style but not the artistic quality of Example - Shepard Fairey 1.jpg and the rest were similar works like the ones previously rejected. Hello aliozbora! If you do pick out a winner, you can ask him/her to revise and or change some things in the design before totally accepting the winning file/s and releasing the prize money. You can even have all their work files (previous entries). if needed. Have several files of the design in different sizes, practically until you're satisfied. This has happened to most of my contest wins. Rather than just lose your prize money to "unsatisfactory" work you're not happy with. To be FAIR to others, although it will cost a little more, EXTEND your contest to get the best from designers. Entry #86 bybd600102 used my image. I'd like to protest that. Please check entry #85, thanks! All in vectors format, thanks! Hello mate, could you please check the entry #81? Thank you for your time. You're assuming everyone here has an empty workload. Some of us are quite busy. A 1-day #extended would be amazing. hola señor, necesita un logo minimalista, o un retrato mas detallado para representar su marca...? A reminder not to end the contest early. My design will be in fairly close to the deadline, but it'll be worth the wait. I reached the same approach that you looking for like the brief and final example, did all changes to look less detailed and got rejected without any feedback. It's frustrating that lack of communication, or maybe you really dont know exactly you looking for. If you see this message, hope you get it and I just want you to know that's ok! Help me to help you. Just one question, you said: "The versions are to be illustrated Shepard Fairey (Obey - We The People posters) without being propaganda style (Not art deco style), black and white contour style, and a minimalist style (a negative space)" . So is it NOT to be in propaganda, black and white countour or minimalist style? Or JUST propaganda style is not allowed? Sorry for my poor English. It is the opposite. You are welcome to submit minimalist, black and white contour or propaganda style (please see FINAL EXAMPLE.PNG) Please just don't go art deco style. Keep it modern. IMPORTANT NOTE: Please take a look at FINAL EXAMPLE.PNG file. As you will see there is a side by side comparison of the picture taken and the illustration (the poster) What we envisage is the same approach. Thank you. I'm not sure why you rejected those entries , can you explain what exactly you want? Please look at the attachments, the ones that are rejected are almost the same as the unqualified examples presented in the brief. And none of the submissions are close to the examples given in the brief yet. We prefer fewer facial detail, and prefer shadow via "spots", not "lines." Also, how many colors are we limited to? 4-5 would be nice, but I'm expecting the answer is 2. I'm on it! Don't you dare end this contest early!! I'm sick of contests always ending prematurely and missing out on (in my opinion) superior work. Anyway, my style of illustrating is VERY similar to Fairey's, so this should be right up my alley! P.S. I was an early donater to the 'We The People" Kickstarter and have 3 signed lithographs in my hallway to prove it, so, yes, I know EXACTLY what you want. Hello there, could you please check entry#11? Thank you so much!